Genetics and Molecular Research (GMR) publishes Book Review, Brief Note, Case Report, Comment, Correction, Errata, Homage, In Memoriam, Letter to the Editor, Methodology, Mini-Review, Obituary, Opinion, Point of View, Research Note, Retraction, Review, Review Article, Short Communication, and Thesis Abstract, with regard to publish the results of original experimental researches that contibute significantly to our main focus on genetics and molecular biology. If you would like for on to consider a review article, please consult the editor first; send a proposed title, a brief outline and a list of papers relevant to the review published by the author(s). GMR is an exclusively online journal. GMR charges a fee at the moment of submission to help finance the editorial process and peer review. The publication fee for the Article is 1450$. The US dollar amount reflects the approximate current foreign exchange rate and is subject to change. This fee covers part of the expenses for final language and technical revision, for page setup, and for publishing online. Please contact the editorial office if you have any questions. All GMR articles must meet the highest standards of scientific quality, both in terms of originality and significance, and the research findings reported should make sub­stantial advances. As it is a journal serving a wide and varied scientific community, article abstracts, introductions and conclusions should be comprehensible to the non-specialist, stressing any wider implications of the study. However, the papers should not compromise on the scientific rigor and detail demanded by an international research journal. The broad readership that GMR attracts gives authors an opportunity to convey to a large audience, as well as to specialists, the importance of their research. The journal is currently indexed in over 64 services; see [https://www.geneticsmr.org]. It is a fundamental condition that submitted manuscripts have not been previously published and will not be simultaneously published elsewhere. With the acceptance of a manuscript for publication, the publishers acquire full and exclusive copyright for all languages and countries. The use of registered names, trademarks, etc., in this publication does not imply, even in the absence of a specific statement, that such names are exempt from the relevant protective laws and regulations and therefore free for general use. All papers should be prepared in U.S. English. An initial evaluation of the language will be made upon receipt of each manuscript. Those that are considered inadequate for initial review will be returned or sent out for correction, at the discretion of the author. The manuscript will be considered officially accepted when GMR receives corrected version from authors with all the corrections requested by the referees. Before final acceptance, a submission letter with the title of the article and names and signatures of all the authors should be sent by e-mail to [email protected]. Galley proofs will be sent in “pdf” form via e-mail for final revision. All authors are co-responsible for their submissions and they should make every effort to check the paper before this final step to avoid costly reformatting and possible introduction of new errors. GMR articles have no rigid length restrictions. They should contain sufficient techni­cal detail for an expert reader to understand and assess the methods and results. There is no page limit for GMR articles, but authors should still be concise, for two main reasons. First, our electronic refereeing system relies on e-mail, and very large files occasionally cause prob­lems. Second, lengthy manuscripts can be cumbersome to read and study. Referees tend to dislike them, and they take longer to process. In addition, readers of electronic journals often print articles to read them. Remember that a 10,000-word article takes up around 11 pages. 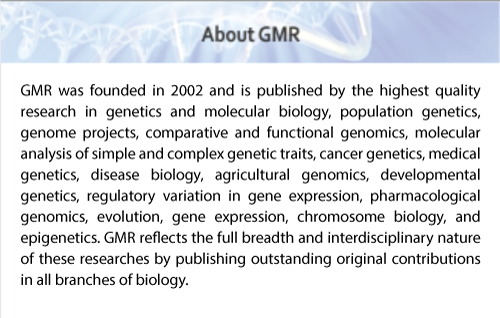 Editorial policies: GMR is a refereed journal. Only original manuscripts will be consid­ered for publication. Manuscripts will be reviewed by at least two independent reviewers before a decision is made on publication. The whole process is conducted electronically to speed progress and final publication. Papers will be published (placed online), once were fully processed. Papers accepted in their final form from January 1 to March 31 constitute the first issue of each volume, and so on. There are four issues per year. Manuscripts (in U.S. English), together with a cover letter from the author responsible for all correspondence, should be submitted to the Editor at [email protected] in electronic format as .doc files saved in Microsoft Word 97 for Windows, or later version. Do not use formatting such as Word’s “Heading” or “Style Sheets”. Spelling, punctuation, sentence structure, spacing, length, and consistency of usage in form and descriptions should be checked before submission. Please also check references for accuracy. Ensure that all figures and tables are mentioned in the text, and that all references are cited in the text. Figure and table files (see below) should be separate. Author submitting the article; article title; authors (full list); article type and session; status of article (e.g., new, revised, etc. ); postal address; e-mail address; phone number; fax number; names and types of the files sent. Revised versions: Authors submitting a revised version of an article, must remember to include a list of changes, and replies to the referees (or technical editor). All the files, not just those revised, for the final draft of paper should be sent. Review: Articles are reviewed anonymously by independent referees. Authors are en­couraged to suggest names of expert reviewers, but selection remains the prerogative of the edi­tors. To facilitate the review process, the authors can send supplementary material, such as cited accepted but not yet published papers, which may be important for assessment of the manuscript. A review article should contain: an abstract of 250 words or less, no more than six key words, a running title and no more than 60 references. It should be divided into sections with ap­propriate tittles and subtitles. Order the sections comprising the manuscript as follows: title, running title, author, address, abstract, key words, introduction, material and methods, results, discussion, acknowl­edgments, and references. Title Page: The title page should include the title of the article, authors’ names (names and initials (only) thinking in indexing services), and authors’ affiliation. The affiliation should comprise the department, institution (usually university or company), city, and state (or na­tion). The title page should include the name and complete mailing address, telephone number, fax number, and e-mail address of the author designated to review proofs. A running title of no more than 60 characters (including spaces) should be provided. Abstract: An abstract of up to 250 words, single-spaced, is required of research articles and reports and should be arranged in one paragraph. The following information (without head­ings) should be included: purpose, methods, results (please report numerical data (means ± SE) for significant results), and conclusions. Review articles also require an abstract, which need not include all of these items. Key words: A list of key words or indexing terms (up to six) should be included. Format: Headings should be bold, and first letters capitalized and left-aligned. All text should be set in Times New Roman font, 12 point, left-aligned, single-spaced. Do not justify the right margin. Leave only one (1) space after periods. Paragraphs should not be indented; there should not be any blank lines between them. Use line returns only at the end of paragraphs. Do not use tabs or spaces to create indents. Use the Symbol font for symbols and special characters. Do not use equation editors or footnoting utilities. Save equations as images. Equations should be numbered consecutively with Arabic numerals in parentheses on the right hand side of the page. Footnotes: Footnotes should be avoided. When their use is absolutely necessary, foot­notes should be numbered consecutively using Arabic numerals and should be placed at the bottom of the page to which they refer. Place a line above the footnote, so that it is set off from the text. Tables/Charts: Special care should be taken to ensure that all tables are properly formatted. Scientific symbols used should be in Symbol or Times New Roman. Tables should be on a separate page, numbered consecutively (with Arabic numerals) referred to by number in the text and designed to fit the column or page size of the journal. Use tables with cells to separate columns. Do not use spaces, tabs or vertical lines. Left justify the title above the table. Indicate each table’s location within the manuscript. Illustrations: Illustrations/figures (photographs, drawings, diagrams, and charts) should each be in a single file, numbered in a consecutive series of Arabic numerals in the order in which they are cited in the text. Illustrations must be submitted as separate files. All illustrations are to be supplied in JPEG (jpg) format in either color or black and white. Images must be saved as separate, stand-alone files. The image resolution should be 300 dpi. Do not embed images within the text file. The placing of graphics in the paper should be indicated in the text and should in­clude the captions for the figures. The authors should also send, by mail, a printed version of the figures. These should be at least 10 x 15 cm, up to US letter size, so that figures can be scanned (in case the figure files are not adequate) to guarantee good quality for publishing online. Abbreviations: Try to use abbreviations in the text sparingly. Write out abbreviations in full before the first time they are used in the text. Use the metric system for all measure­ments without periods (cm, mL, s). Define all symbols used in equations and formulas. Do not abbreviate the word “Figure” or “Table” in titles or text. Acknowledgments: All acknowledgments (including those for grant and financial support) should be typed in one paragraph directly preceding the reference section. Authors of manuscripts submitted to GMR are requested to state the source of all funding that enabled the described research to be undertaken. References: References in the text should include the name of the author and the year in parentheses, e.g. (Searle, 1961) or (King and Wilson, 1975). When a reference with more than two authors is cited, only the first author is named, e.g. (Comstock et al., 1958). The refer­ences must be cited in the text in chronological order, e.g. (Ideber, 2001; Uetz, 2002; Ottavai, 2004). References to “unpublished results” and “submitted papers” should appear in the text in parentheses following the name(s) of the individual(s). Example: (Pereira KS, Martins PK and Silva TM, unpublished results). No more than 40 references should be cited in a Full-length paper, 20 references in a Short Communication and 60 references in a Review article. References, under the heading “References”, should include only works referred to in the text. This section should be arranged in alphabetical order under the first author’s last name. References should be cited as follows: journal papers - names and initials of the first four authors (after that using et al. ), year, journal title abbreviated according to PubMed or Web of Science, volume number, first and last page numbers; books - names of authors, year, full title, edition, publishers, address (city); articles published in symposia - names of authors, year, full title of book, name(s) of editor(s) in parentheses, publisher, address (city), first and last page numbers. The references should consist mainly of articles from indexed journals. Refer­ences for techniques that are essential for understanding or repeating the methods should always be in easily accessible (indexed) journals. Reference style: The list of references at the end of the paper should follow the format requested by GMR. The link below can be accessed to see how the references should appear.